Yes, we also add waterfalls to swimming pools! 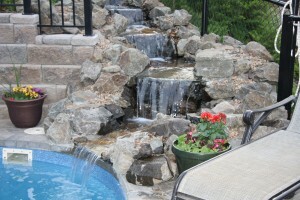 Here is a gorgeous waterfall addition to an existing salt water pool. Sadly, this photo series was before I really took many pictures of projects, and I seemed to always forget the "before" shot. Anyway, this should give you an idea of what can be done. Please note, with salt water and a waterfall running all the time, there is evaporation. This can be a pain if you are manually adjusting your salt levels. Incase of people with electronic salt distributors, its not a biggie. The pool isn't large, and I only had a tight spot between a chain-link fence, and an AllanBloc retaining wall. At the top, is the kids play area, where there is also a small upper-pool. We did install a small retaining wall between the fence and where the waterfall was to go. I needed a nice finished edge for the neighbours to see, and a sturdy support for the feature. What you don't see, is how I transitioned from the waterfall, over the existing pool deck. I'll let you figure out how I did it and have no leaks marrying the 2 features together OR damaging the pool deck.